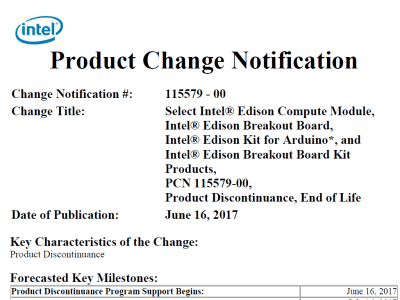 Not even three years after its noisy introduction at the 2014 Maker Faire in Rome, the Intel Edison module has been discontinued. The introduction of the Edison was accompanied by the launch of the Galileo 2, intended to replace the already failed Galileo 1. Apparently the second version didn’t do any better. The Joule module hasn’t even celebrated its first birthday and is binned already. Users who rely on one or more of these products can place last time orders (LTOs) until September 16, 2017.
tinyTILE is a new low power board based on the Intel Curie module, offering quick and easy identification of action and motions, features needed by "always-on" applications. 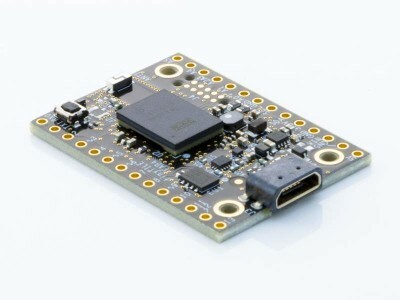 The board, a miniaturised adaptation of the Arduino/Genuino 101 board measuring only 35 x 26mm, can be programmed using the Arduino IDE, the Intel Curie Open Developer Kit (ODK), or Anaren Atmosphere. In this article we build a webserver on an Intel Edison and use it with a tablet to operate an LED while sitting on the couch. This simple pro- ject is intended as a demonstration and is easily expanded with addi- tional functio-nality such as interfacing it with switches and sensors, and the display of images and multiple web pages.